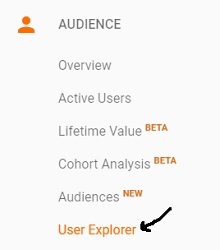 Google Analytics has got a report called the ‘User Explorer‘. 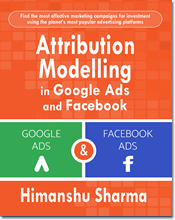 As the name suggest, this report provides detailed insight into individual user’s activity on your website. 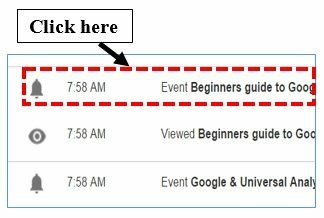 For Google Analytics, (by default) a user is a combination of unique random number and the first time stamp. This combination is called the ‘Client ID‘. Here, ‘14525672358’ is unique random number and ‘86738999’ is the first time stamp. Client ID is assigned to each unique user of your website/app. The client Id is set by _ga cookie (which is the Universal Analytics Cookie). At present, the ‘Client ID’ dimension is available only in the ‘user explorer’ report. You can not use this dimension in a custom report. In the mean time, if you wish to use ‘client ID’ in a custom report, then you need to create your own custom dimension which can retrieve the client IDs. The ‘client ID’ dimension is a high cardinality dimension. What that means, this dimension can have tens of thousands or even hundreds of thousands of unique values assigned to it. 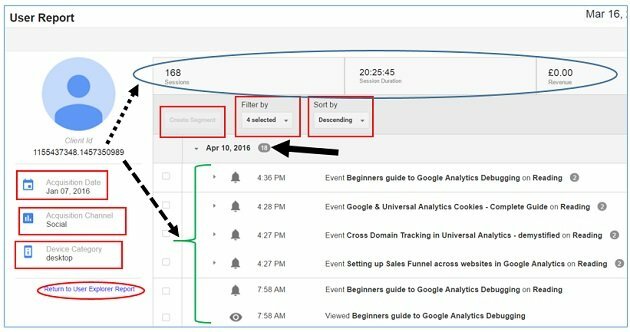 Google Analytics reports which contain high cardinality dimensions are usually sampled. If you have got considerable data sampling issues, then the ‘user explorer’ report won’t be very accurate. Also worth noting that, the client ID exist only on the device/browser where it has been set up. Because of this reason, the ‘User explorer’ report of a non-user ID view, will show user’s activities, only for a single device and browser. 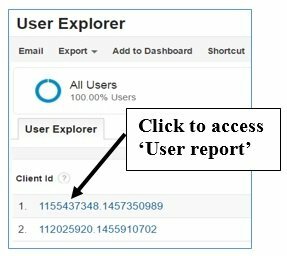 If the user changes his device/browser while interacting with your website, then that user activity won’t be reported in the ‘User explorer’ report of a non-user ID view. Thus you may not always get the complete picture of a user’s journey on your website. 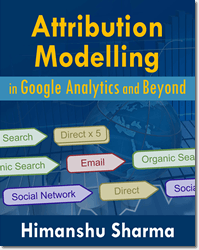 Consequently, if you do multi channel marketing and/or get considerable amount of traffic and conversions from different devices, then this report may in fact provide, muddy insight. User id is a unique set of alphanumeric characters (like dfrgdKer5535925) assigned to a user, so that he can be identified across devices/ browsers. 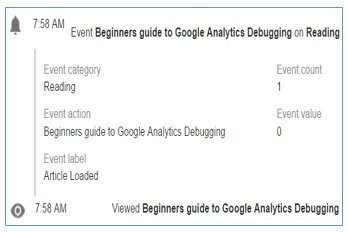 Google Analytics cannot generate unique IDs for you, that can be used as user ids. You need to generate your own unique ids and assign these IDs to new and returning users through your user authentication system (like website login). Example of a user ID is a login ID. Any website which lets user login, can use the user ID feature. User id view is the GA view which collects only the data related to user ID session. 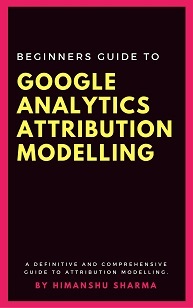 In the case of user id views, GA calculates unique users by counting the number of unique users IDs assigned, instead of counting the number of unique clients IDs assigned to users. At present, the ‘User ID’ dimension is available only in the ‘user explorer’ report of a user ID view. You can not use this dimension in a custom report, yet. In the mean time, if you wish to use ‘User ID’ in a custom report, then you need to create your own custom dimension which can retrieve the User IDs. 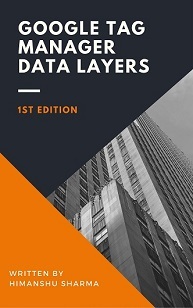 The ‘User ID’ dimension can also be a high cardinality dimension and can thus create data sampling issues in the ‘user explorer’ report. The ‘User explorer’ report of a user ID view, can show user’s activities, across devices and browsers. You get a better picture of a user’s journey on your website through ‘user explorer’ report of a user ID view. The ‘user explorer’ report is also available in mobile app views. 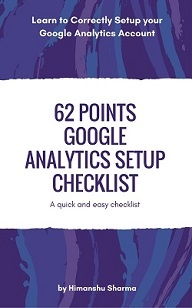 This report is similar to the ‘user explorer’ report available in a non-user ID view. However, it shows mobile app usage data (sessions, average session duration, bounce rate, revenue etc) instead of website usage data for each user, via the new ‘Client ID’ dimension. 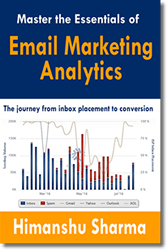 This report provides detailed insight into individual user’s activity on your mobile app (instead of your website). Though ‘user explorer’ report would be available in any GA view, you create, the one in the AMP view is worth mentioning. AMP stands for ‘Accelerated Mobile Page‘. It is an open source mobile page format which is used to build mobile web pages with static content that loads instantly on mobile devices. AMP view is that GA view which includes only the AMP traffic. The ‘User explorer’ report in AMP view is similar to the ‘user explorer’ report available in a non-user ID view. However it, shows website usage data for each mobile user, via the new ‘Client ID’ dimension. By default, a client ID is a combination of unique random number and the first time stamp. But in case of AMP, client ID is a string which starts with the word ‘amp-‘ and contains alphanumeric characters. What does that mean, if your website has got mixture of regular mobile pages and AMP pages, then same mobile user can be counted as two different users. 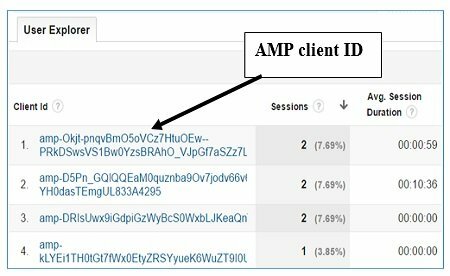 This is because when a user navigate from a non-AMP page to a AMP page (either in same or different sessions), he will be assigned a new client ID. This new client ID will make him a new unique user. To fix this issue, do not mix AMP pages with non-AMP pages. 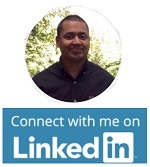 #2 This user was first acquired on Jan 07, 2016. See the ‘Acquisition Date‘ column on the left hand side of the report. #3 The user was first acquired through social media. See the ‘Acquisition Channel‘ column on the left hand side of the report. #4 The user was first acquired through a desktop device. See the ‘Device Category‘ column on the left hand side of the report. #5 The user has generated total of 168 sessions, on the website so far. #6 The user has spent 20 hours, 25 minutes and 45 seconds in total, on the website so far. #7 The user has generated zero revenue on the website (as the website is not an ecommerce website). #8 The user last visited the website on April 10, 2016. #9 On April 10, 2016, the user had total of 18 interactions (pageviews, goal completions, purchase and/or events) with the website. On a side note, the ‘Reading’ event is triggered when a user is actually reading an article and not just skimming it. That’s how you can read the ‘user report’. 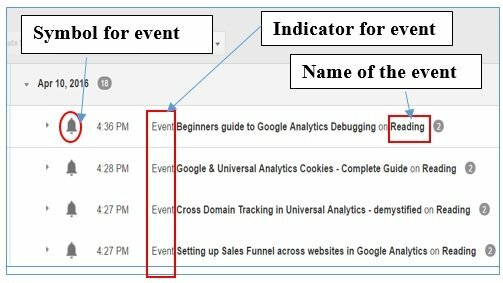 As the name suggest, through this menu, you can filter out particular type of user’s interactions like events. 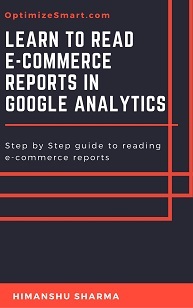 With ecommerce tracking enabled, the ‘user report’ becomes super useful in understanding the purchase journey. 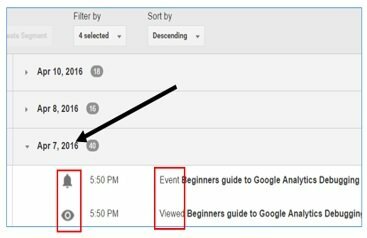 By reading the ‘user report’ in ascending order, you can see the user activities from the start to finish in your selected time period. When you read the ‘user report’ in descending order, you are then forced to read the report backwards, from finish to the beginning. I am not sure, why Google choose to sort the user report in descending order, by default. It should be sorted in ‘ascending order’ by default. 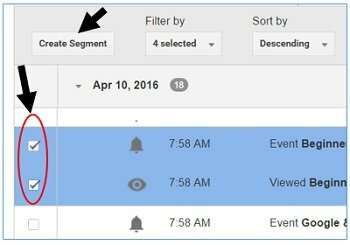 Step-2: Once you select one or more user’s interactions, the ‘create segment’ (shown above) will become enabled. 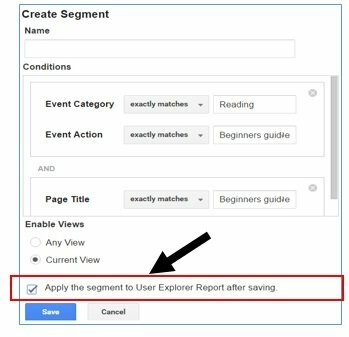 Step-3: Name your segment, select the GA view, where you want this segment to be available, click on the checkbox ‘Apply the segment to user explorer report after saving’, if you want to apply this segment to the ‘user explorer’ report. 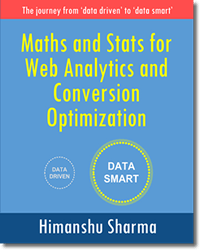 Analyse the journey of people who are making a purchase or completing a goal conversion, to better understand their conversion path. 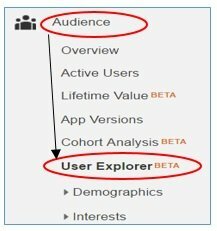 Analysing the user journey of random people is pointless and this is very true in case of ‘user explorer’ report, where you are more likely to see tens of thousands of ‘users’ report, one for each unique client/user ID. 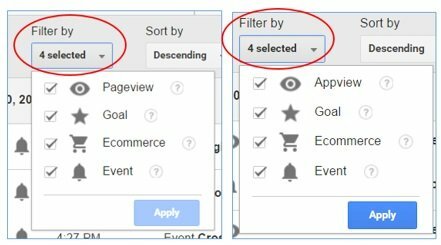 So sort the user explorer report by revenue, transactions or goal conversion rate before you read it or access a particular ‘user report’.